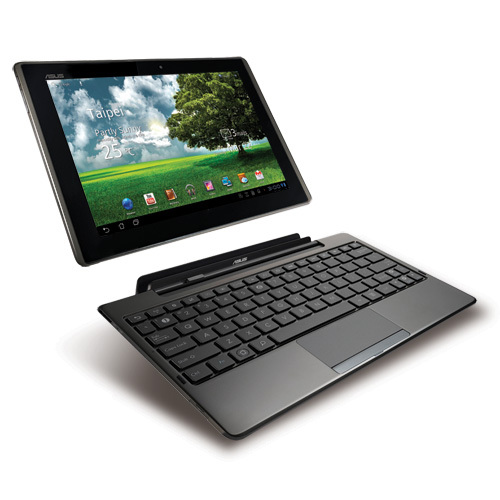 Just a week ago, I purchased the new Asus Eee Pad Transformer TF101, a tablet device on the Android platform with a dockable keyboard. 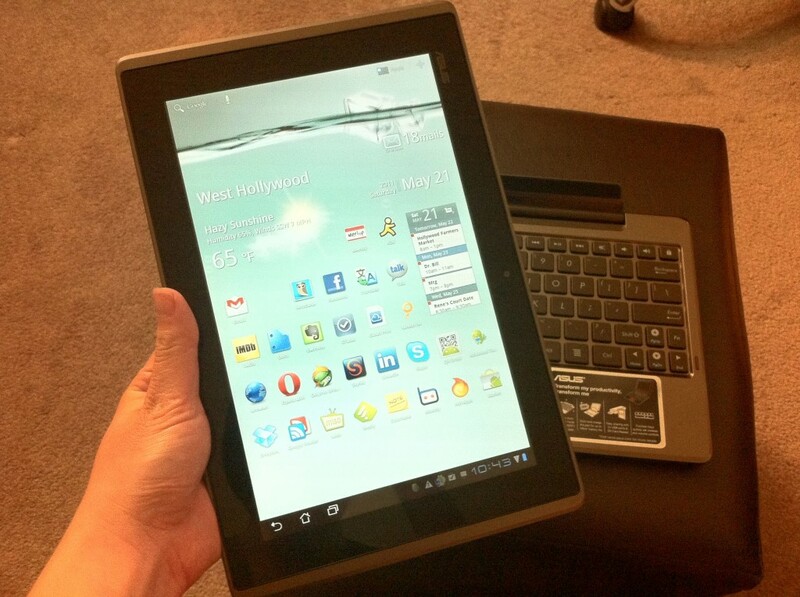 This is my first Android and tablet device, so there’s a lot for me to learn. Many of my friends have been curious about this device, and seeing how I’m one of the first few to actually get my hands on one of these devices (it sold out within hours of its release and has been on backorder ever since), I figured I should write a review of what I think of it so far. First, let me give you my background with mobile devices, so you can better understand where I’m coming from and better gauge how useful my review will be to you. I’ve been using iOS on iPhone 3G and iPhone 4 for a few years now, so I’m very familiar with how that OS works and what Apple product limitations are. For several years now, I’ve wanted a mini laptop because I wanted a device that would be small and light/mobile with a real keyboard so that I could write up blog posts in a jiffy while sitting in a coffee shop. While I have improved my typing speeds on my iPhone over the years, that speed is nowhere near how fast I type on a real keyboard because there’s just nothing like being able to feel the keys while you type, so having a real keyboard was very important to me. I was also very drawn to the new ebook reading devices, and I really liked how the iPad offered this while offering more than just a reading device. 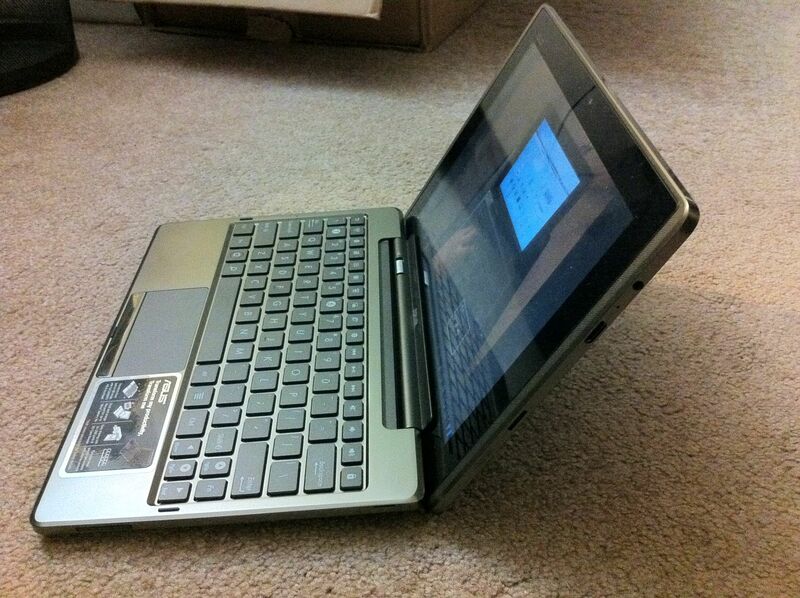 However, I decided against the iPad 2 because it cost a lot without offering a real solution to a real keyboard. Yes, I know I could have purchased a bluetooth keyboard, but then the price of the device becomes even higher and I’d have to purchase some sort of case that helps me use the keyboard with the iPad in all the different sitting conditions I would inevitably sit in with my device. I also wanted to be able to play games and view movies on whatever device I got, and for a while I wasn’t into buying a computing device that didn’t have a real operating system because it would limit what games and videos I could watch. However, I think that we’ve hit a point in the iPhone and Android market places that most of what you can and want to do on a computer can be done via some app found on either platform. 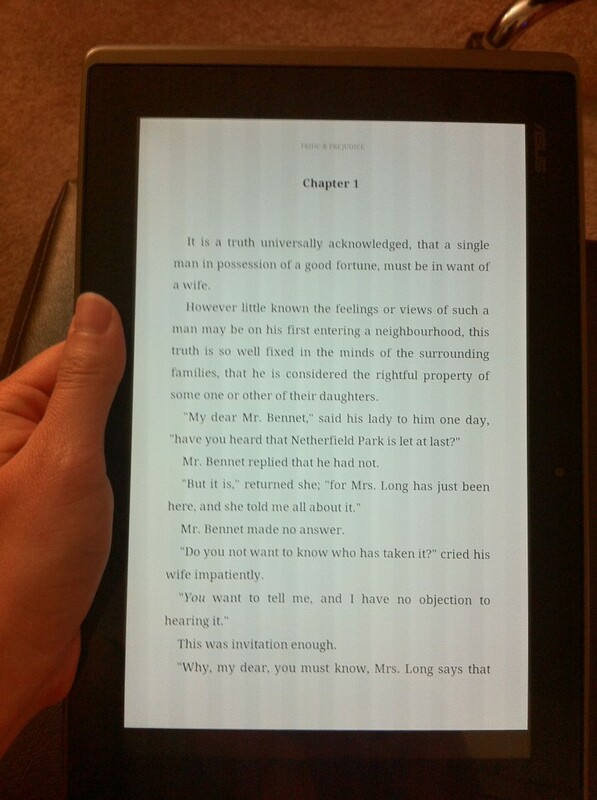 There are still drawbacks to not having a real operating system, but I was willing to give that up for a tablet device that offered a new way to read books. 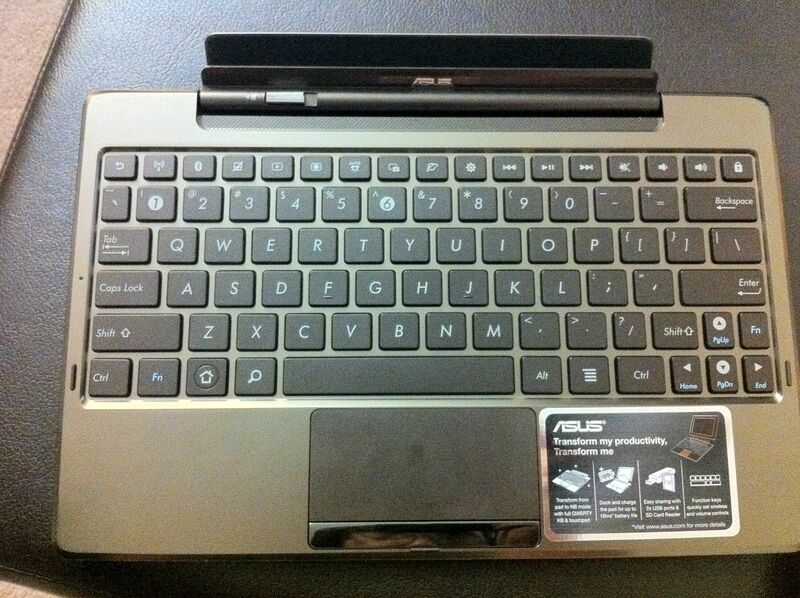 When Asus introduced their new Transformer tablet with docking keyboard, I was excited. Here’s a device that looks like a laptop when the tablet is docked, and can transform into a tablet device when not docked. Plus, it offers a mini HDMI port, USB slots (in the keyboard dock), and memory card reader slots (mini and SD), which makes it way more customizable to my needs than the iPad. Sits just like a laptop, more important than I originally thought. Is this even possible with an iPad? Transformer transformed from laptop into tablet, it’s like transforming your makeup from day to night! The Transformer tablet costs only $399 for the 16GB version and $499 for the 32GB version. I got the 16GB version because I can always buy bigger memory cards and throw it into the SD slot if I really need the space. Plus, with digital clouds like Dropbox, Google Music, and Asus’s 1 year free unlimited web storage, there’s not really a need to have too much storage on your actual device now. The keyboard dock costs an additional $149, but it’s well worth it. That put my purchase to about $550 before taxes. Feels perfect under my fingers! My original concerns about the device was that the keyboard might be too small, as I have never owned a 10.1 inch laptop before, but after using the keyboard for a week now, I find that it is no different to me than a 12 inch laptop keyboard or my regular full sized keyboard. I think I have slightly smaller hands than most, but Rene has also been using this keyboard without any issues and his hands are larger than mine. The keyboard is optimized for the Android platform while still offering all my needs from a computer keyboard. Chicklet keyboard plus multi-touch pad, note all the Android friendly keys! The mouse pad is like that of the new Apple laptops with multi-touch functionality, though I still need to learn how to use it as I haven’t owned a laptop with multi-touch pads before. However, because the tablet is a touch screen, I find that I often don’t even want the mouse pad and I turn it off with a handy button on the keyboard. It’s much easier to just touch the screen where I want my mouse to go, or scroll through pages by swiping on the screen. This is more intuitive than I originally would have thought and I think that future laptops might do away with mouse pads altogether because this way of using a computer is just way more intuitive than a mouse pad. The tablet and touch screen works just as amazingly as many of the videos online show it to work. From what I recall how iPads feel at the Apple store, this touch screen works exactly the same. It’s very intuitive, and really needs no explanation when you try it out. The battery life is amazing, both with the dock and without. When the tablet is connected to the dock, it adds a few extra hours of battery life, which I’m sure I’ll have plenty of use for while I’m mobile. The power cable is a bit short, so I probably won’t ever be able to use it in a coffee shop, but with the amazing battery power on this device (about 16 hours with the dock and 9 hours without), I probably won’t ever need to charge while I’m out and about. The weight is very light, exactly what I was looking for. It’s small and light enough to hold in my hands while I’m walking without tiring me out and it fits in my purse without adding too much bulk or weight to my bag. It’s also super sleek looking when it’s closed up. Looks just like a laptop, you can see the outward facing camera at the bottom. There are both front and back cameras on the tablet. I haven’t figured out how to video chat with it, but the camera seems perfectly adequate with an easy to use camera app. On a video comparison I saw online, I think the iPad 2 cameras are better quality, but not by too much more. At the end of the day, though, I’m not going to make a movie using my tablet so the quality only needs to be good for video chatting, and let’s face it, even the highest wifi speeds nowadays downgrade the best HD web cam images. It’d just be wasteful for the camera to be the best HD thing you’ve ever seen. The Transformer has wifi capabilities, but not 3G. I didn’t want a 3G device since there are plenty of wifi in public now, and if I really need 3G, I always have my iPhone. 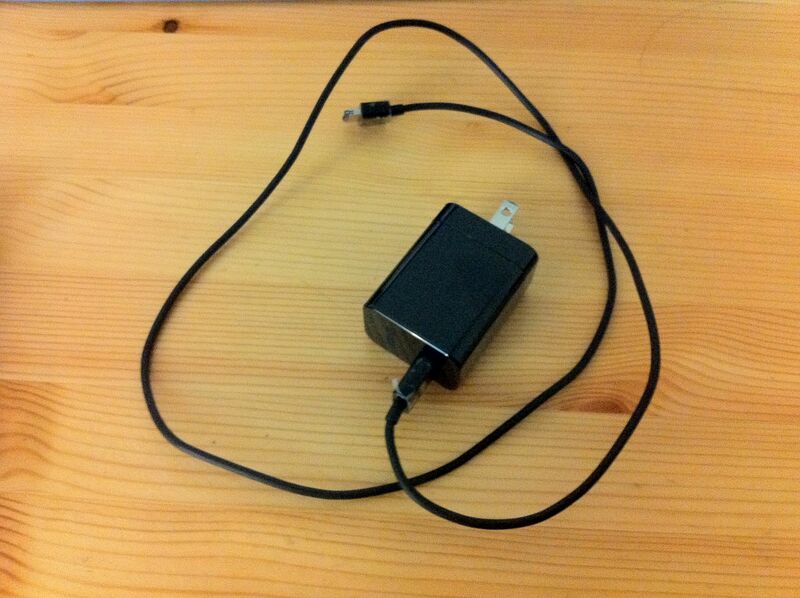 I think there are likely ways to tether, but I haven’t looked into it yet. The wifi has worked perfectly, I haven’t had any issues with it yet, and the speeds are amazing! As a reading device, I love it! I’m currently looking to figure out which eReader app will be the best one so that I can read both on my Transformer and on my iPhone without switching apps. I’m hoping to read a lot more now that books can fit in my tablet, I can’t wait to get reading! Digital Jane Austen, yes please! 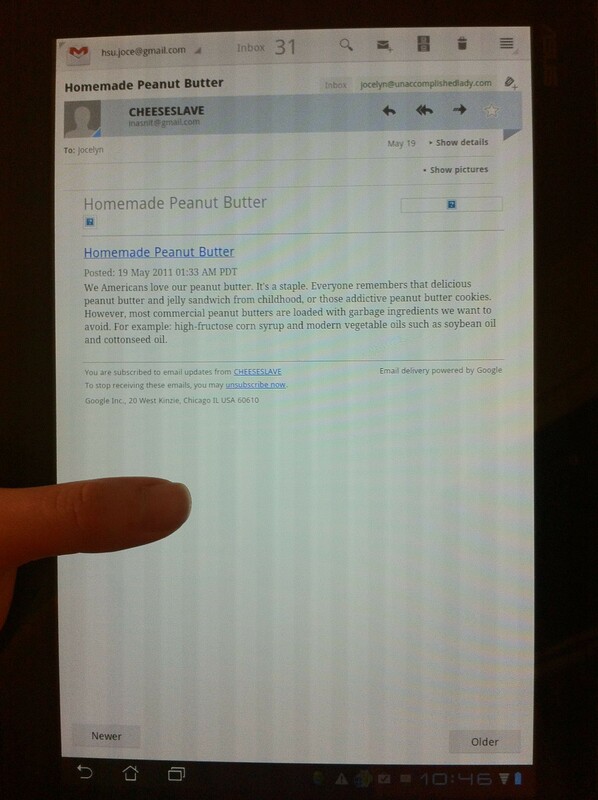 The tablet is also an amazing way to read email. I used to hate having to sit at my desk scrolling through hundreds of email at a time. Even worse on my iPhone, the screen is just too small. But with the Transformer, reading through hundreds of email is almost fun and the interface (I’m using the Gmail app) is just really intuitive and quick to breeze through. Something just feels different about reading email when you can “touch” it with your fingers. And when I have to write a long email, I just dock my tablet to the keyboard dock and I’m all ready to write a huge novel if I need to. Doesn’t look as exciting as it feels to experience it, email should always be read on a tablet! Writing on this tablet is pretty easy. The Transformer comes with a bunch of Asus apps, such as Polaris Office, which looks pretty much like your basic word document software. I haven’t tried it much because I’m all on Google Docs now, but the Google Doc app is pretty easy to use on this tablet, and I love that it syncs online as soon as I write something. I’ve been asked if the device is good for note taking, and the answer is yes, it’s as good as any mini laptop would be. In the video department, I love that I can watch Flash videos. Apple refuses to give support to it, and that really did kill my want to buy an iPad for $500. No matter what I add to an iPad, there is just no way for me to watch Flash videos, and as a filmmaker and crazy consumer of online videos, this just isn’t acceptable for me. Now, neither Netflix nor Hulu Plus have apps on the Android market which work with the Transformer tablet yet, which I wish I would have known about before, but I’m confident that those apps will likely be made eventually. Plus, I might be able to get some sort of app or trick that will allow me to view Netflix and Hulu via the browser, as I’ve heard that people have done this before. I’ll need to do more research on this for sure. At any rate, there’s no pesky Apple software getting in my way! As for games, I know I’m not going to be able to play something like World of Warcraft or Left 4 Dead on it, but then again, those are games I enjoy better on my desktop computer. On my Transformer, I’ve enjoyed several games of chess with Rene (something we’ve never played together till we got this device), and I’ve even started to fall for Angry Birds (a game I didn’t really like on my iPhone). Something about tablet gaming is quite satisfying to me, and I’m now on the hunt for more games to take advantage of it. BTW, one of our favorite things to do with the Transformer now is to sit casually at our favorite restaurants while we play a two player game on the tablet. There’s just nothing quite like it! The rest of my review would be on the Android as a platform, but I feel that I’m not truly familiar with it enough yet to give a good review. For now, I’ll give my take on it as an iOS native user. Most important things I need on my iPhone is available on the Android market, so most of my needs are met. There are no folders like on the iOS, but I don’t really miss it since there’s tons of space on each page for all my apps and more. There are five pages which I can move between, and they are prettier than the iPhone pages. The background is a lot more customizable and has tilt sensitive backgrounds, which makes it more fun than on the iPhone. Highlighting, cutting, copying, and pasting are slightly different from the iOS, but once I got used to it, I think it’s perfectly usable, maybe even better than the iOS. I think with a little more time on it, I’ll be as spiffy with it as I am on my iPhone. The apps store is also a lot easier to use than the Apple app store. Like by A LOT! It doesn’t keep asking me for my password, I can browse through tons of new apps without having to refresh my page and updating apps is way more intuitive. Plus, I can download stuff while I’m on my desktop browser without having to go through something like iTunes. Apple should really take a look at how Android does it and change up how they do their app store. The Android also doesn’t have those annoying numbers that pop up next to my app. I know that they’re useful on my iPhone when I want to know how many emails are waiting for me in my inbox, but I find that it generally annoys me when it’s on an app I don’t use often, and it slows my productivity because I keep wanting to check these apps that I would never think about if it weren’t for that pesky number. Instead, when I open up my Transformer, I go to the apps that I want to go to, and that’s that. Oh, and I also like that I can choose which browser is the default. I don’t really like that I have Firefox and Opera on my iPhone but I never use them because the phone just defaults to Safari. With the Android, I get to choose which one I want, and I like that customizability. AND, when I use Google apps, Rene and I can easily switch between our gmail accounts with a touch of a button, making the device really easy to share with a colleague or family member who might use the device as much as you do. In fact, that goes for most parts of the Android platform. I like to customize my stuff for my own needs, and Android really does provide that. In fact, it might provide too much customization and that’s likely why it’ll take me a few more weeks to figure everything out about the Android platform. Would I buy it again? Yes, without a second thought! Are there things I would like the App store to have which aren’t there yet? Yes, but in the meantime, there’s still plenty I can do with my Transformer and I’ll gladly wait for those apps to come out. Do I recommend it to others? Most definitely so! 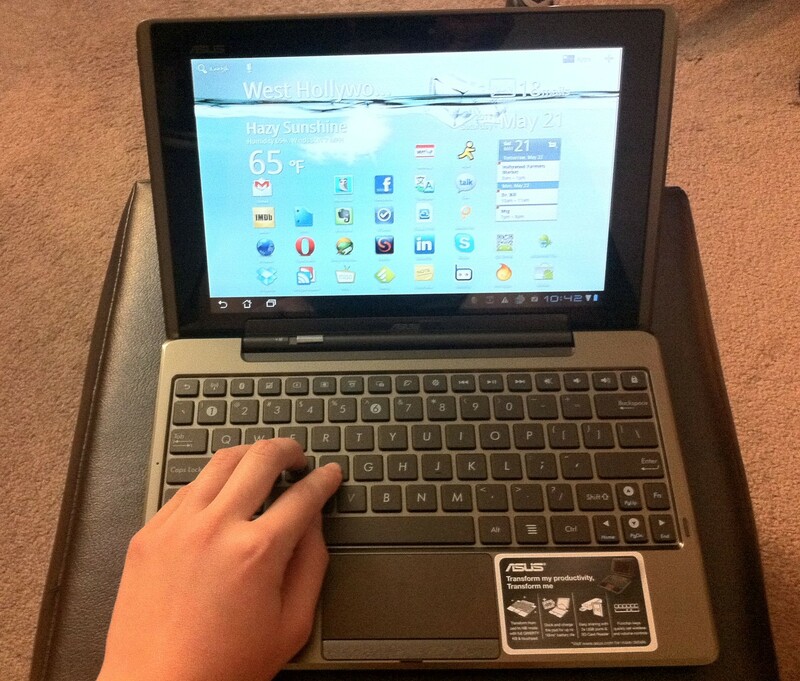 If you’re thinking about buying a tablet device or a mini laptop, I highly recommend looking into this tablet. It’s fairly versatile and I think many consumers will like what Asus is offering here. I know this was a long post, but I hope that it is helpful! If you have any specific questions, please feel free to ask in the comment section below and I’ll get back to you as soon as I can! Uh oh sounds like someone is headed straight for Android devices next year…LOL!!! Yeah that’s why I moved to Android love the customization. Sounds like it’s a solid device going to have to check it out. Good write up! You’re so right. When my iPhone 4 needs upgrading, I will seriously be considering the Android options out there. What Android devices do you use? Thanks, I hope my review was useful for you! look at playon.tv, we actually canceled our cable last year and just stream from our computer to the tv. And they have an android app so once you’ve set it up on your local wifi, you can stream from your home computer to an android device anywhere. The playback is much smoother on the tablet than I had on my evo. That’s awesome! I know Rene has been drooling over PlayOn for a while now. We never fully got on board since we have so many other options available, but maybe now that we have this Android tablet, there’s good reason to finally purchase it! how can I make the email screen bigger? Is there an option? That’s look divine and pretty cool also. 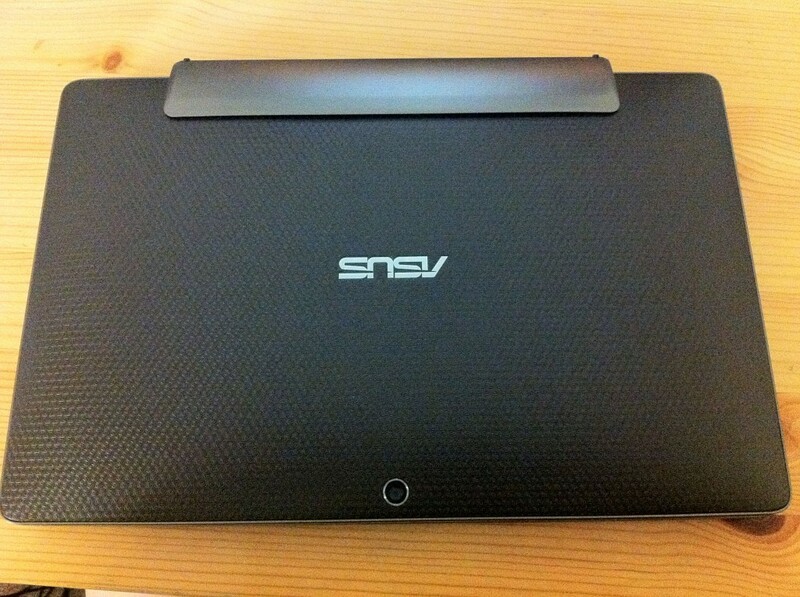 I’m really impressed by see the Asus transformer. Thanks mate.